Well, it has been a while since I’ve checked in here. In the meantime, I accepted a new job; traveled to China, it’s Special Administrative Regions – Hong Kong and Macau, and Taiwan; and started coordinating a move to New York City. Yes, we’re moving! We’re in the midst of figuring out logistics of a cross-country move, which is a lot more challenging than I initially imagined. Little by little, though, we’re putting the pieces in their places, packing up all our belongings, and mentally preparing for everything to come. It’s an exciting time. Certainly, it is bittersweet to be leaving Chicago, but this move seems to be the right thing right now. And then there was vacation! The trip was planned with my friends as a last hurrah before I start working full time again, and what a final hurrah it was. I’m still editing the photos and will hopefully share some soon, but in sum, we ate a lot of good food, saw a lot of cool sites, and soaked up all the crazy awesome little things that make up Chinese culture. It was also fun to see the differences among Taiwan, Hong Kong, Macau, and mainland China as we saw it in Beijing. It was a really special trip and, like usual, I’ve been inspired to cook all the foods we ate. We didn’t make it to Sichuan province, but we still managed to eat a few Sichuan dishes and brought home Sichuan peppercorns to replicate everything. 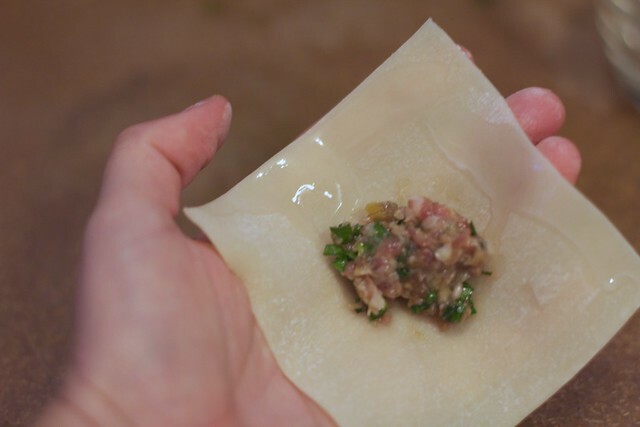 We learned how to wrap wontons in a cooking class in Beijing and I used that same technique to wrap up some seasoned ground pork. This recipe is a project, to be sure, but totally worth it. I would recommend making your own Sichuan chili oil, which is really easy once you gather up all the ingredients. You can likely find everything at a Chinese grocer, including the green Sichuan peppercorns. They’re sometimes found under the label Prickly Ash. Several ingredients are found online, also. I roughly followed Lady and Pups’ recipe using the amounts below. You may end up with a lot of leftover filling. 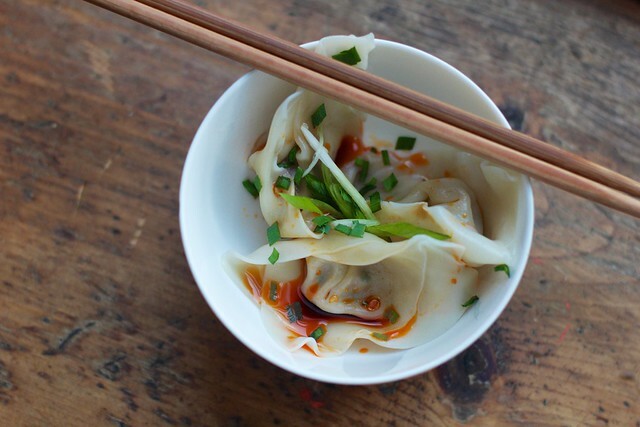 You can sauté the filling and add it to noodles, or just buy more dumpling/wonton wrappers and keep wrapping! Oh, and the Sichuan chili oil is great on so many things: salads, noodles, eggs, etc – anywhere you would use a hot sauce, you can use this oil. Gather the ingredients for the chili oil. Heat all the oil in a large saucepan over medium-high heat until the oil is hot. You know it’s hot when you insert a wooden chopstick and bubbles form around the chopstick. Add all the ingredients and cook for a minute or so. Remove from the heat and let cool for several hours, up to a full day. After the oil is fully cooled and room temperature, strain out all ingredients. For the wontons, combine the pork with the rest of the ingredients in the list. Mix well. Put the wonton wrappers on a plate and cover with a wet cloth. You’ll also need a small bowl of water to seal the wontons. 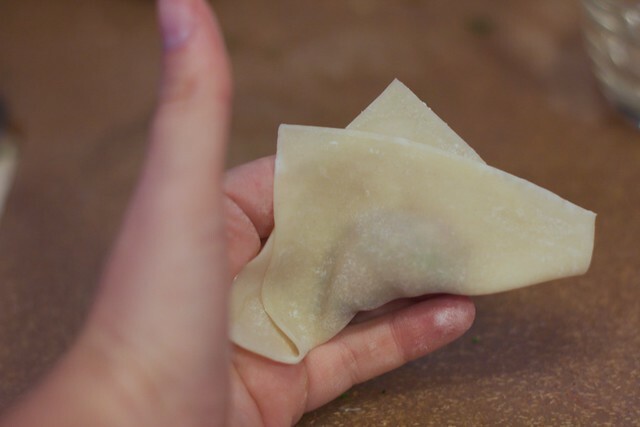 To make the wonton, place the wrapper in the palm of your hand. Dip your finger in the water and wet the edges of the wonton wrapper. 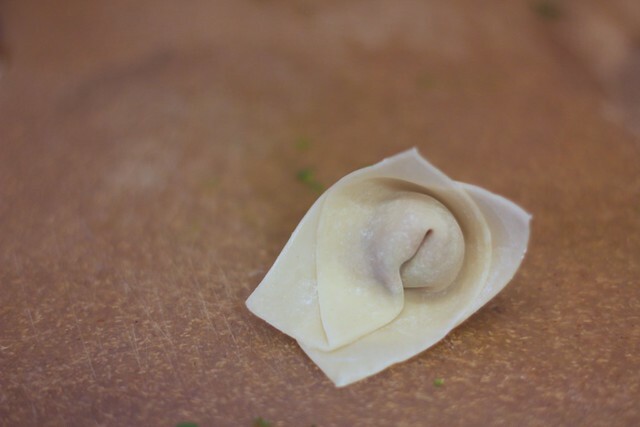 Place a half teaspoon of wonton filling in the center of the wonton. It’s very important to keep the amount of filling to a half teaspoon or less, otherwise the wonton will not fold properly. Fold the bottom corner of the wrapper up and at an angle, so the two corners form little mountain peaks like in the picture below. Then grab the two folded corners on each side of pull them down to meet. Cross one edge over the other and squeeze together to seal the wonton. To cook, bring a pot of water to a rolling boil. Drop the wontons in the water in batches and cook for five minutes. Remove with a slotted spoon and allow the water to drain away from the wonton. 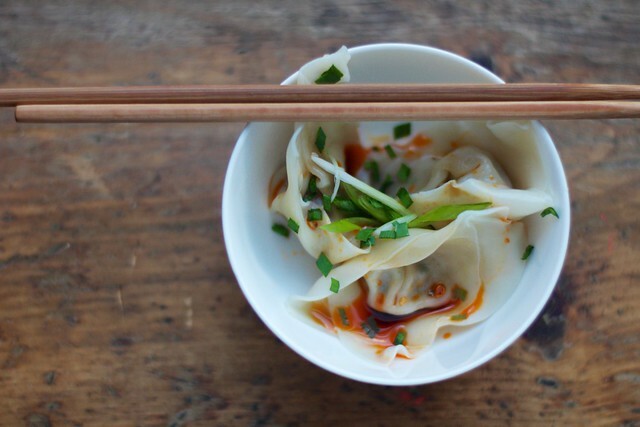 Place the wontons in a bowl and drizzle with soy sauce, black vinegar, Sichuan chili oil, and sliced green onions + chives. I’ve been keeping a mental list of the millions of things I love about summer. Besides the weather, happy people everywhere, and endless activities, one thing I have been appreciating lately is the changing availability of fruits and vegetables. After a long winter of squash and potatoes, a new fruit or vegetable comes into season each week during the summer! 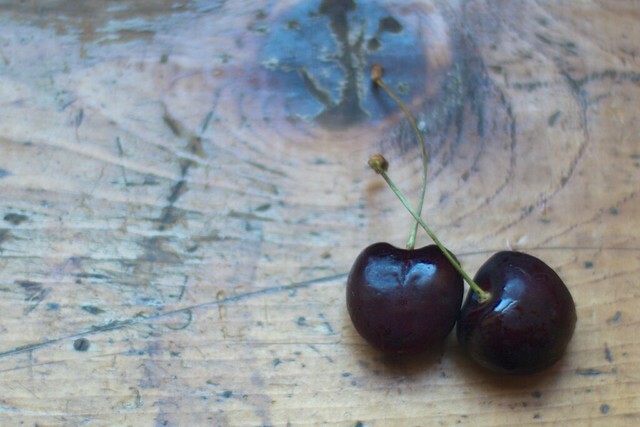 One week we have asparagus, the next I’m buying cherries by the bushel. It’s pretty neat and the limitless variety keeps me both inspired and eager to eat. 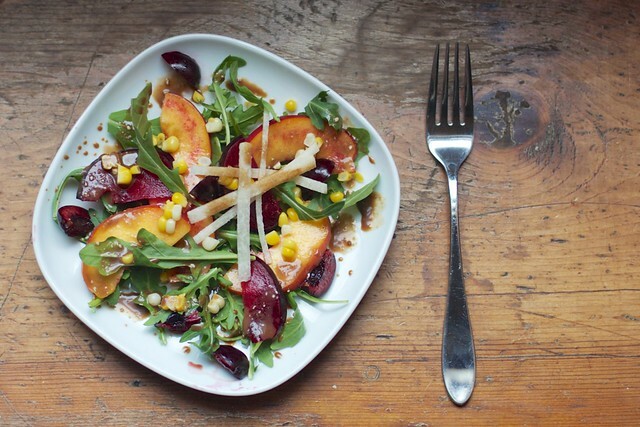 So here we are in stone fruit season with yet another salad. I mean, who cooks in the summer? Mostly I crave big bowls of lettuce simply dressed with olive oil and lemon juice, but every once in a while, I’ll get fancy and make my salad something special. Now, I don’t usually eat salads with balsamic vinegar. Maybe it was over done in the early aughts, but I just do not care much for it. 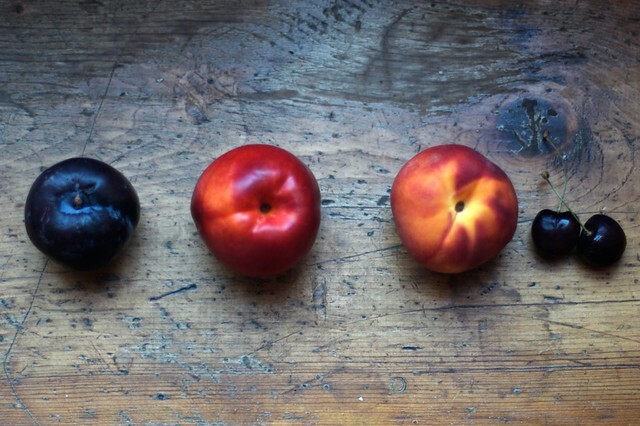 With stone fruits, however, this yogurt balsamic works perfectly over their acidic sweetness. Top it with sweet corn and jicama, and you have the perfect mid-summer salad. *Vary the amounts of each based on your preference. The dressing recipe yields a big batch; store leftover in the fridge if needed. Cook the sweet corn using your favorite method. I just boil the cobs for about 5 minutes. Let them cool, then cut the corn off the cob. 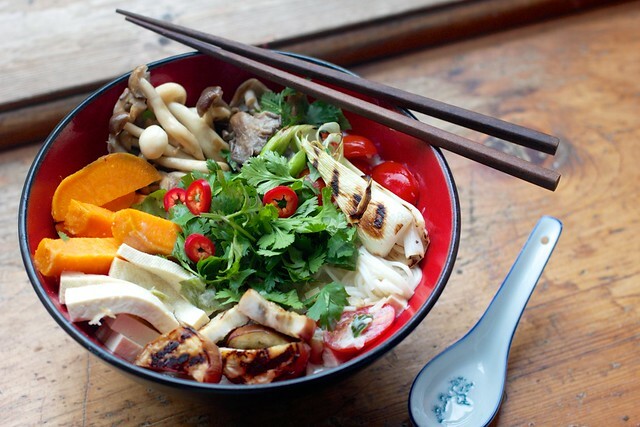 Layer the vegetables and fruit in a salad bowl or on a plate. For the dressing, combine all the ingredients in a large mason jar or bowl. Shake/whisk to combine. Pour over the salad and eat! Yogurt. I don’t really remember eating it much until I studied abroad in Australia and found the creamiest of creamy yogurt. Seriously, why is Australian yogurt so creamy? I think it’s the bacteria profile. I’ve tried to find similar varieties in the US but haven’t been successful. Those so-called Australian-style brands don’t replicate my memories. It was also in Australia that I discovered Greek yogurt covered in fruit, muesli or granola, and honey. In 2006, the Aussies were eating that stuff like crazy. At least, they were in the little coffee shop and cafe that I worked in. Quick shout out to the Aussies that pay a livable minimum wage. As a barista and occasional sandwich maker, in 2006 I was making $17/hour. Seriously. Anyway, it was only a couple years ago that I started eating yogurt of the savory variety. I don’t even know why. One day, instead of adding honey, I threw in a little salt, and I’ve never turned back. 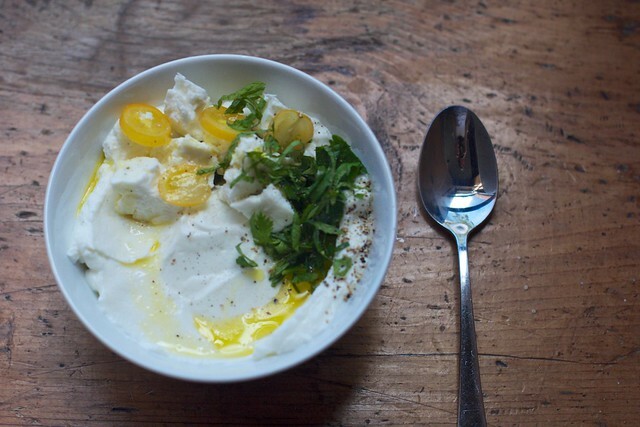 My most recent iteration of savory yogurt includes truffle salt, but I’ve eaten varieties covered in za’atar, sprinkled with sumac, aleppo pepper, and dried mint, or others that are reminiscent of tzatziki. Sometimes just a dusting of cumin and ground coriander do the trick. For texture, add roasted nuts or seeds. I’ve even used edamame before. Think of yogurt as a blank canvas and you’ll start to see the possibilities. 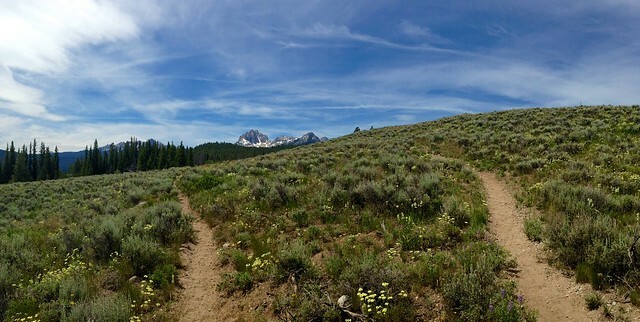 In other news, Eric and I went to Idaho for the 4th of July and my birthday and had a blast backpacking in the Sawtooth Wilderness, visiting the little towns of Stanley and Ketchum, and exploring Boise via breweries. It was a really fun and affordable trip thanks yet again to our Southwest Companion Pass. The full set is here, but below are a couple favorite pics. 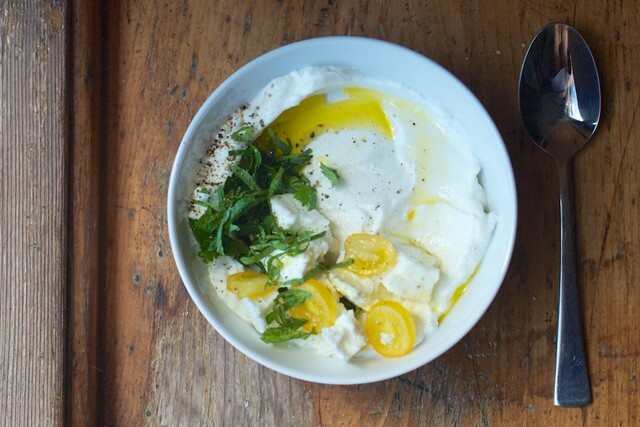 Now, go eat some savory yogurt. *Vary amounts of each based on how much yogurt you want to eat! This makes the perfect mid-morning snack. 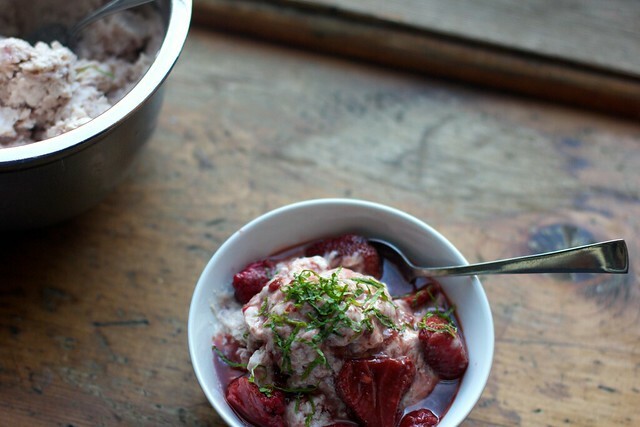 Put the yogurt in a bowl, top it with everything, stir, eat. Always add the salt to taste – a little bit, stir, taste, add more if needed. I was cleaning out my cupboards the other day and found one of the few souvenirs I brought back from Ethiopia last summer: berbere, a deep crimson spice mix that flavors a lot of Ethiopian foods. It’s a bit spicy and really flavorful, and I’ve been using it on everything. 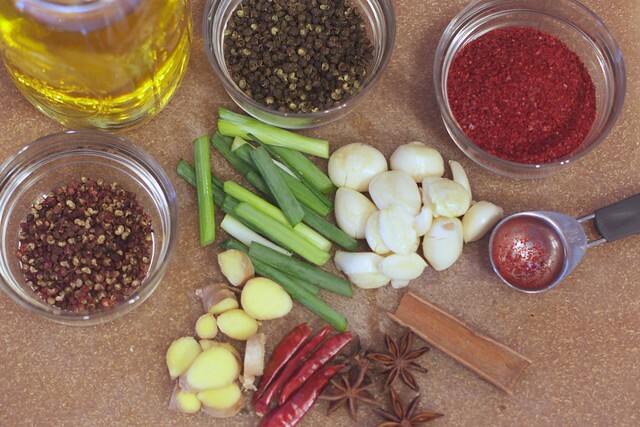 Berbere vinaigrette. Berbere cheese sauce over roasted broccoli and romanesco. Berbere yogurt dip. And this, Ethiopian ful, which is basically a stew made with dried fava beans that is eaten for breakfast. I regret never having tried ful while in Ethiopia – though I filled up on nearly everything else – so I’ve been wanting to make this at home. And the verdict is… yum! It’s so, so easy, too. I added a bunch of toppings that I had laying around, but they’re all pretty much optional. I saw ful served with eggs and crusty bread in Ethiopia, but the avocado, yogurt, feta, roasted tomatoes all added something nice as well. Next time I’m thinking an aleppo pepper oil to drizzle. The berbere here is essential. You can buy a mix online or at a local spice shop, or you can try making your own at home. Combine the dried fava beans with 3 cups of water and cook on a low simmer until all the liquid is absorbed. In a large pan, heat the clarified butter over medium-high heat. Add the garlic and cook for a minute. Add the berbere and cook another minute longer. Add the cooked fava beans and 3/4 cup water. Season with salt and let cook for about 5 minutes, until the sauce thickens. 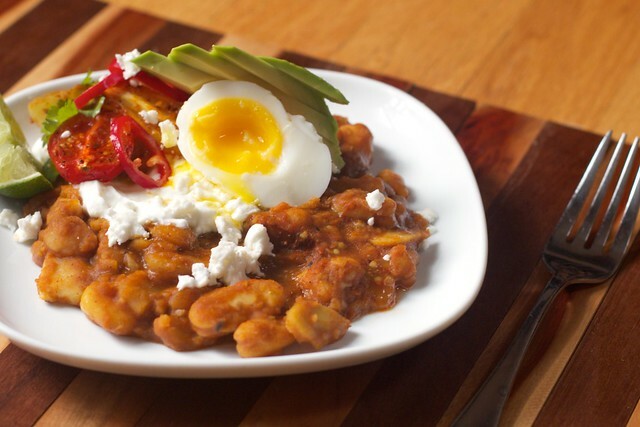 Break apart the beans a bit as they cook more. To serve, top with any or all of the garnishes listed. Eat with a spoon or fork or as they do in Ethiopia – with bread as your utensil! I have lived in Chicago for seven years now. That is an insane number to me, but I guess the old adage is true – time flies when you’re having fun. Still, I can’t believe I have lived here that long and only within the last couple years have I discovered how easy it is to get to the Korean grocery store and find all kinds of pan-Asian goodies. It has almost become part of my weekly shopping ritual. That said, if the Korean or other Asian grocery store is not part of your weekly shopping ritual, you can still make this dish. Admittedly, though, it just won’t be as good. It just can’t be! But if you want to go the extra mile, you can order a lot of ingredients online, and trust me when I say it is worth it. I tried making a version of this that included only easily obtained ingredients, and it just wasn’t the same. Still good, but when tasted side-by-side with the more authentic version, I had to admit that one definitely had more flavor and depth than the other. 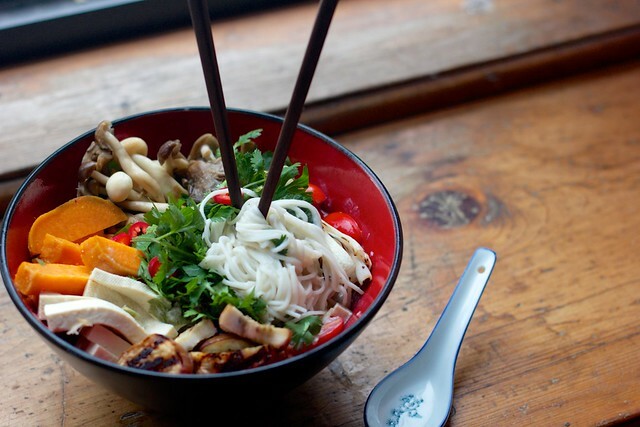 This noodle dish runs somewhere between a soup and noodle-with-sauce thing. You’ll have a bit of coconut-y juice at the bottom of your bowl, but there really isn’t enough broth to fill your bowl to the brim. The vegetables here are all optional and you can sub in whatever you think would taste good. I had spring onions from the farmer’s market, so those definitely made it in. I cooked all the vegetables separately, which may seem time consuming, but I like doing it that way so the flavors don’t get muddled. The end result tastes very fresh and healthful. *The curry paste recipe here is just enough for this dish, but feel free to double or triple the recipe to have a supply of curry paste. It freezes well. *I included my notes for substitutions in parentheses, but do try to find the real stuff. To make the curry paste, chop each of the ingredients into small pieces. In a mortar and pestle, grind the ingredients together – start with one, then once it’s mashed nicely, add another, and so on. Add a bit of kosher or other flaky salt with each ingredient to help macerate each one. At the end, you should have a nice paste, but if you’re having a hard time getting it to that consistency in the m&p, you can use a blender or food processor. In a large pot, scoop a big heaping tablespoon of the coconut cream that gathers on one end of the can into a pan. Stir it around and let it sizzle. Add the curry paste and let cook for a couple minutes. Add the rest of the coconut milk and cream and water. 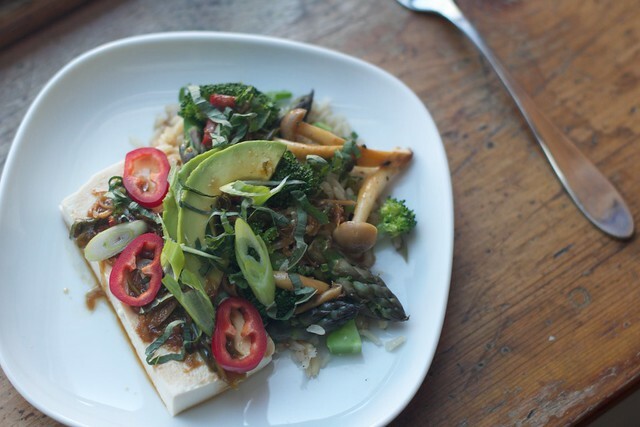 Also add the tofu. Turn heat to medium low and let it slowly warm. 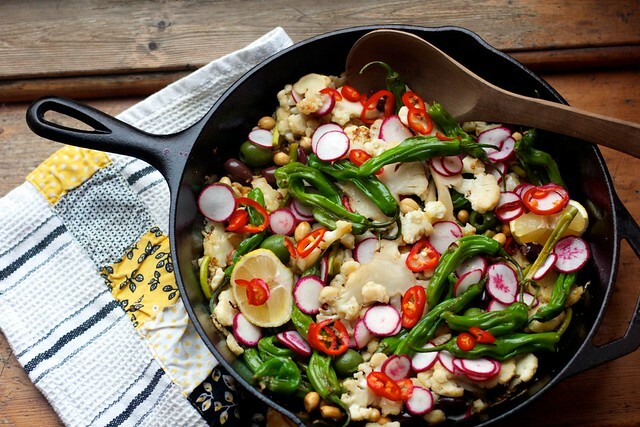 When everything is ready to go, add it all to the pot with the coconut curry. Toss the tomatoes in at this point as well. Taste for seasoning (add salt if it tastes bland or just off). Garnish with cilantro and red chiles. A couple years ago, I read this recipe for roasted strawberries and thought, “why would one want to alter a perfect summer strawberry?” Then I bought two pounds of strawberries at Costco – admittedly not perfect summer strawberries – and decided to try it. WOW. wow. The beauty of roasting strawberries is that it coaxes this deep, rich flavor out of even mediocre strawberries. I’m still not sure I would roast those little bright red beauties from the farmer’s market – those just taste too good on their own – but for every other strawberry in the world, this will now be my go-to preparation. This was also my first stab at a frozen dessert, and I must say… again… wow. The key here is to consistently churn and stir the yogurt as it’s freezing. If you have an ice cream maker, that works as well, but you can still get pretty nice results by just pulling the bowl out of the freezer every 30 minutes to an hour to stir the mixture around. The more frequently you pull it out and stir it, the creamier the result. As an experiment, I just let a bowl of yogurt freeze without any stirring. I ended up with a bowl of ice, essentially. I don’t really like big frozen strawberry chunks in my ice cream or frozen yogurt, so I just used the balsamic strawberry sauce that results from the roasting to flavor the yogurt and then poured the fruit over the top for serving. Much better than giant frozen chunks of strawberries mixed in. 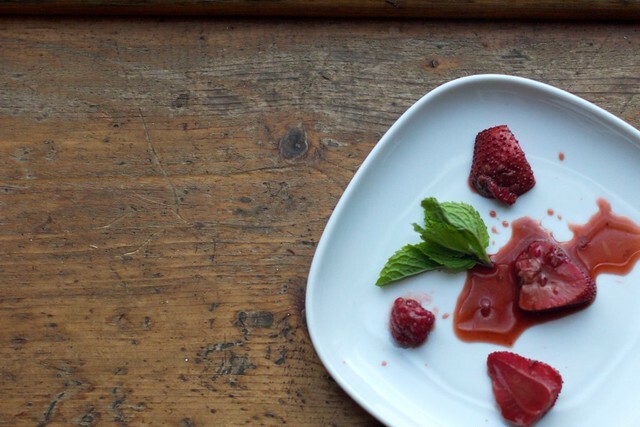 You might also notice some raspberries in these pictures. I had a few of those and therefore tossed them in as well. Preheat the oven to 350. On a deep baking tray, scattered the strawberries and cover with a bit of salt and the vinegar. Toss around to coat all the berries, then spread the berries into a single layer in the dish. Bake for 35-40 minutes. When done roasting, pour the strawberries and all the juices into a bowl and set aside. In a metal bowl, combine the yogurt, maple syrup, and 1/2 cup of the liquid that results from roasting the strawberries. Have a taste here… the yogurt should taste just slightly too sweet. When it freezes, that sweetness will dull a bit and be perfect. Put the bowl in the freezer. Every 30 minutes to one hour, pull the bowl out and stir the mixture, being sure to scrape down the sides and incorporate any icy parts. Continue to do this until it reaches the consistency you like, between 4 and 6 hours. 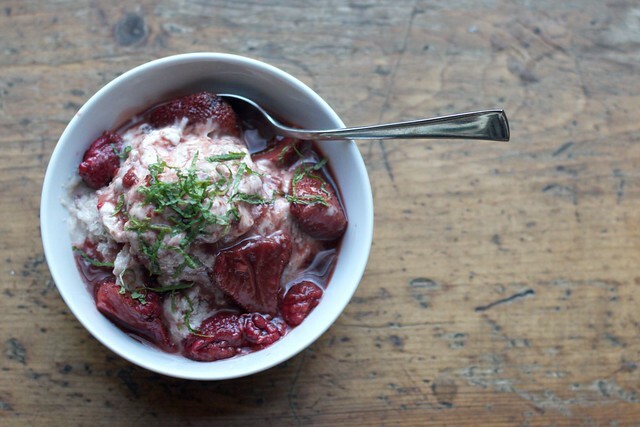 When ready to serve, scoop the frozen yogurt into a bowl, top with roasted strawberries and a bit more sauce, and garish with fresh mint. It’s all about the saucy sauce. This is really a simple recipe. Barely a recipe, actually. Make some rice. Steam some veg. Buy some tofu. And mix it all together with a swanky, saucy sauce. I have a pretty well-stocked Asian pantry these days. Gochujang and miso are staples in my fridge, and I have both light and dark soy sauces in the cupboard. 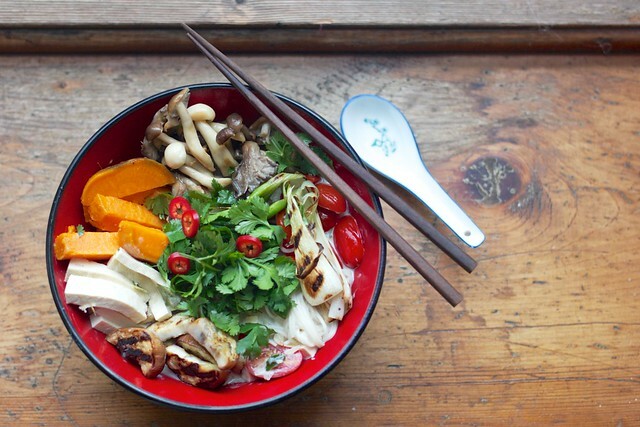 Usually, whipping up a little Asian-inspired sauce for things isn’t challenging. But if you don’t want to go through all the trouble of sourcing every single bottle available in the Korean, Vietnamese, and Chinese grocery stores, my staples are a nice soy sauce, fish sauce, and sesame oil. 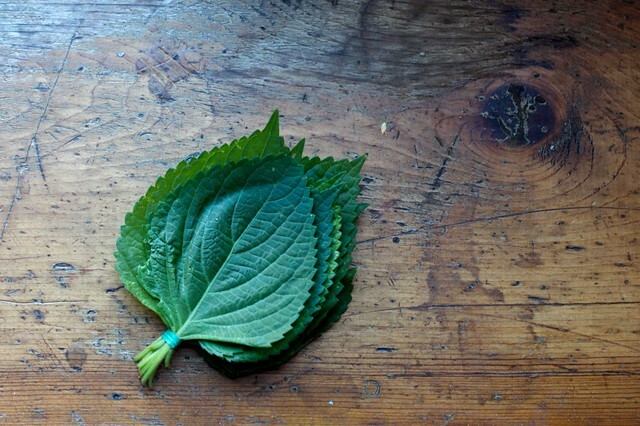 I use a lot of rice wine vinegar, but other acids work well (lime, for instance). Mirin is another nice thing to have but I can easily do without. Fish sauce on the other hand… it’s hard to replicate that flavor. Just don’t smell it and you’ll be fine. 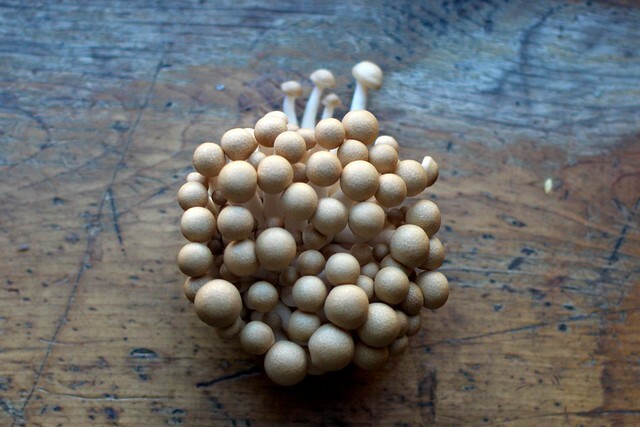 This recipe has some specialty items from the Asian grocery store, but feel free to swap in any other mushroom for the buna shimeji or tarragon for the perilla leaves. We make rice bowls a lot and they’re pretty versatile – truly a kitchen-sink kind of dish if there ever was one. The last note here is about the tofu. Get the good stuff or make your own. 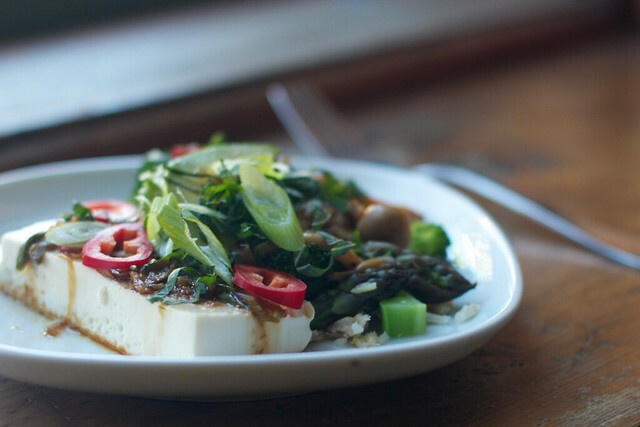 Sometimes I’ll use a super firm tofu in rice bowls, but this one uses a creamy, silken tofu. The custard-y texture is a nice contrast against crunchy vegetables. Making the bowls is easy enough: prepare the rice according to the package. Chop the vegetables into bite-sized pieces and steam or blanch them for 1-2 minutes. You want them still snappy. Combine the rice, veggies, and avocado in a big bowl. Dole out individual portions in smaller bowls or on plates. For the mushrooms, I had a bit of this handy douban oil from this recipe on hand (except made with gochujang and coconut oil), so I quickly pan-fried them in that for about 2 minutes. If you don’t have chile oil on hand, just fry them in any other high-smoking-point oil. The key to mushrooms: fry them on high heat. Otherwise, they’ll release moisture and you’ll steam them. Top individual portions with mushrooms. 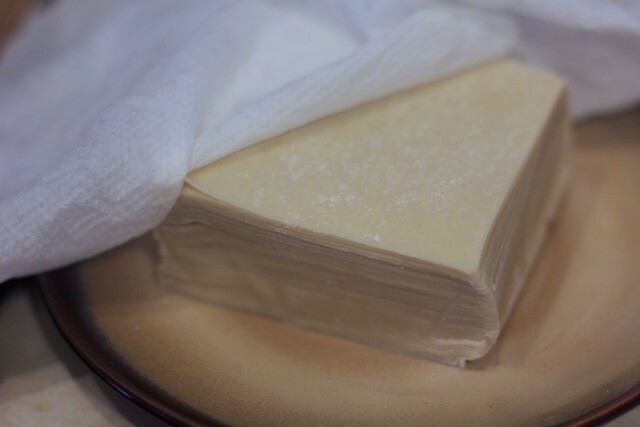 Slice the tofu into 1/2-inch long pieces – kind of like thin bricks. Place a slice on each individual portion. For the sauce, toss everything into a jar or deep bowl and shake or whisk vigorously. Pour over individual servings to taste, and top each bowl with the green onions, perilla leaves, and red chiles. Eric and I just returned from a whirlwind, week-long trip through Texas. With stops in Austin, El Paso, and San Antonio, we managed to cover a lot of ground. One thing I learned in Texas: I can eat tacos every. single. day. So many tacos. We even tried San Antonio’s famous puffy taco. But now that we’re home, it’s time to detox and eat some vegetables. I went a little overboard at the grocery store when we got back and bought nearly every single vegetable in the produce aisle. I had to take stock yesterday of what we had in the fridge and come up with a plan to use it all. First stop: pan-roasted cauliflower with many good things on top. In other news, Eric and I were talking the other day about this whole gluten debate after watching this Jimmy Kimmel clip revealing the absurdity of the gluten-free trend. As always needs to be said, this absurdity does not extend to those who have celiac disease. Nonetheless, all this talk about gluten got me thinking about what a wonderful community of bacteria and enzymes I have in my gut. I am literally tolerant of everything. I eat street food in the most exotic of destinations, and I can eat anything under the sun that my little heart desires – without consequences. When I see the problems that others have with their guts, I realize how lucky I am with my little community in there. So, this recipe. We’ve got cauliflower, of course, but also shishito peppers (shishito peppers!! ), radishes, red chiles, and even garlic scapes (garlic scapes!!). 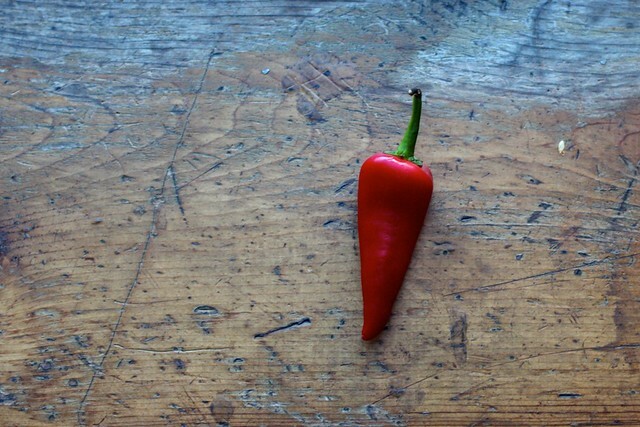 Shishito peppers are one of those foods… you know the ones… if I see it on a menu, I have to order it. If I see it at Joong Boo, I have to buy it. Same goes for garlic scapes, garlic chives, ramps, or any other iteration of garlic or its family members. Thus, put these things together and you get a real winner. 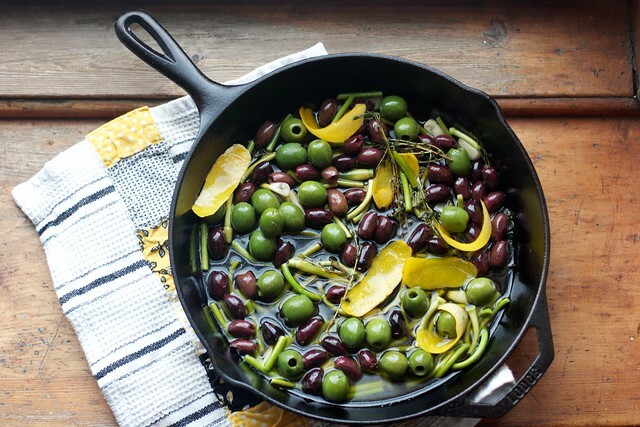 To make the marinated olives, combine the olive oil, garlic, scapes, lemon peel, and fresh herbs in a large pan over medium-low heat. Let the oil warm and infuse the flavors for ~5 minutes. Add the olives, stirring to coat them. 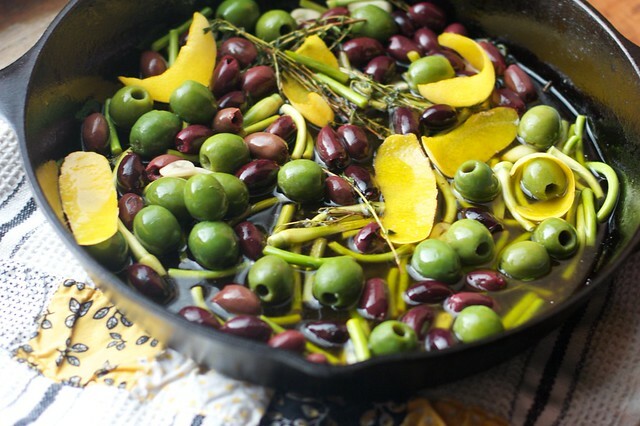 Turn off the heat and transfer the olives and oil to a jar or other container. You can keep all the flavoring ingredients in the mix if that’s easier. 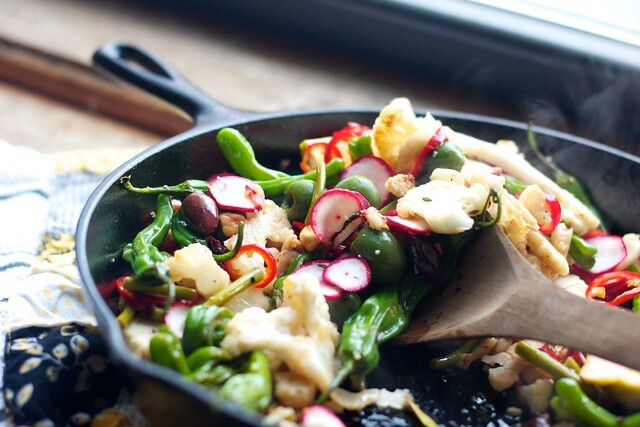 Without washing the pan, turn the heat to medium-high heat and combine the chiles, cauliflower, and shishito peppers in the pan. Add more of the flavored olive oil if needed. Season with a bit of salt and pepper and allow the cauliflower and peppers to cook until the cauliflower is browned and the shishito peppers are blistered. When this happens, turn off the heat, top with radishes, peanuts, a bunch of marinated olives and fresh lemon juice. Taste and adjust for seasoning and serve. This is a quick little lunch that I whip up sometimes. 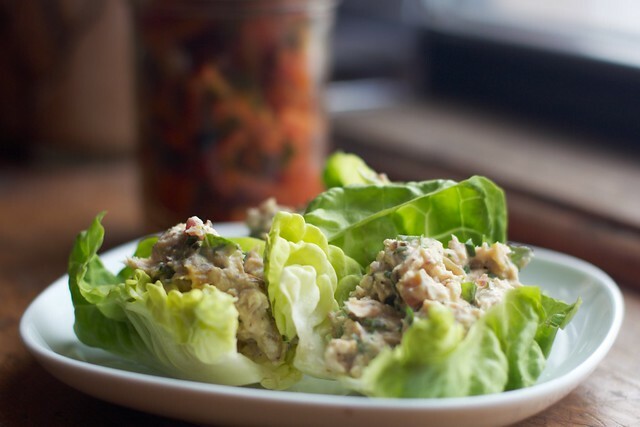 Tuna salad is often a kitchen-sink dish for me, and this one became a way to use up some quick-pickled swiss chard stems left over from a salad last week. I read a great tip on Food52 a while ago about keeping a bag of vegetable food scraps in the freezer. When the bag is full, pull it out and make vegetable broth. You can improve the flavor of tons of things with broth – cook rice, or lentils, or beans in the broth instead of water. I’ve been tossing in kale stems and leek tops, but chard stems are too pretty for the freezer. Instead, I quick pickled them and waited for an opportunity to use them. To make the quick pickles, put the chopped stems in a jar. Combine the vinegar (I used distilled white vinegar), water, salt, and curry powder in a pot and bring to a boil. Once boiling, poor the pickling brine into the jar. Cover with a lid and put in the fridge to cool. In a mixing bowl, combine tuna, greek yogurt, mustard, onion, and herbs. Finely dice the pickled chard stems and combine with the tuna. 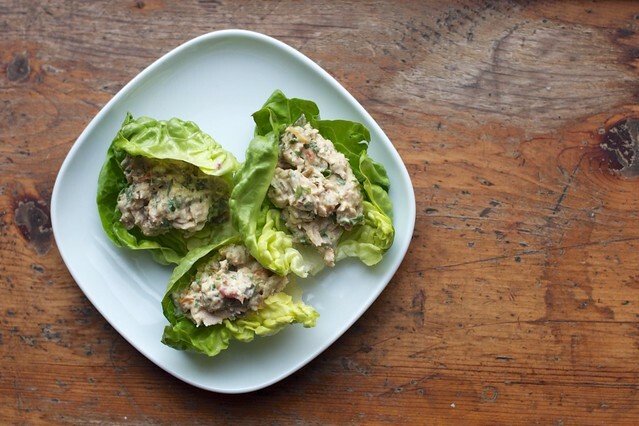 Peel leaves of the lettuce head off and fill with the tuna salad. I sat on the stoop this morning drinking coffee, catching up on emails, and doing a bit of work. It was chilly – around 50 degrees – but the sun was shining and I was determined to get some rays on my face. Nothing like the morning sun to set your mood for the day. 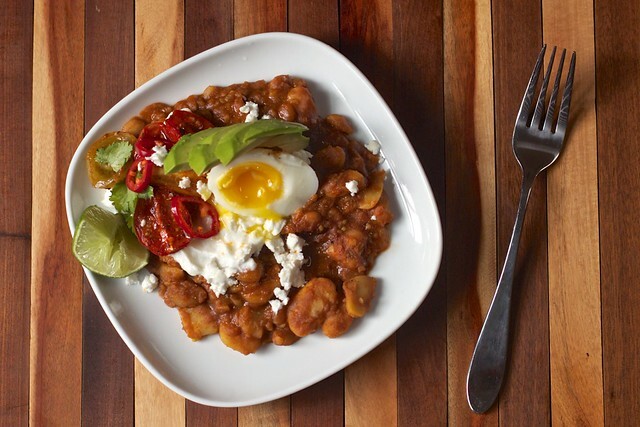 This recipe comes mostly from Yotam Ottolenghi’s book Plenty. 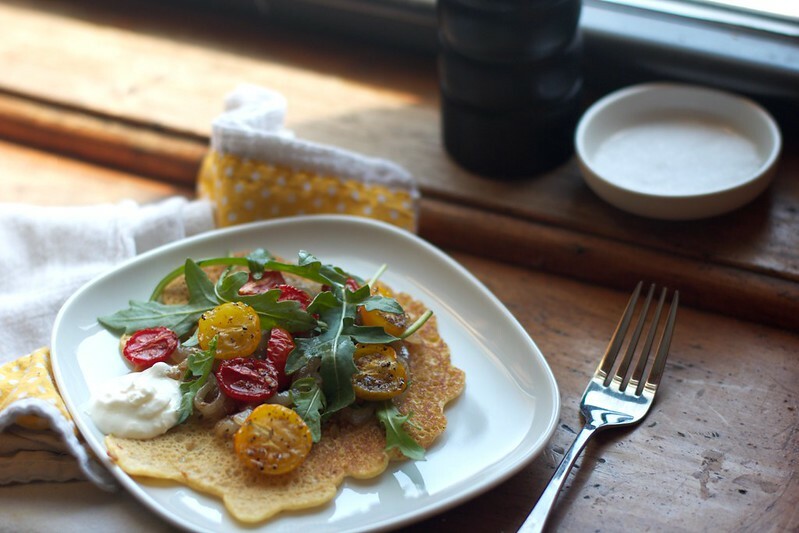 I added a few tweaks but the pancakes, the layering of flavors, the techniques – all Yotam’s genius at work. In subsequent servings I sprinkled roasted pumpkin seeds and Aleppo pepper on top. Smoked paprika would be lovely as well. 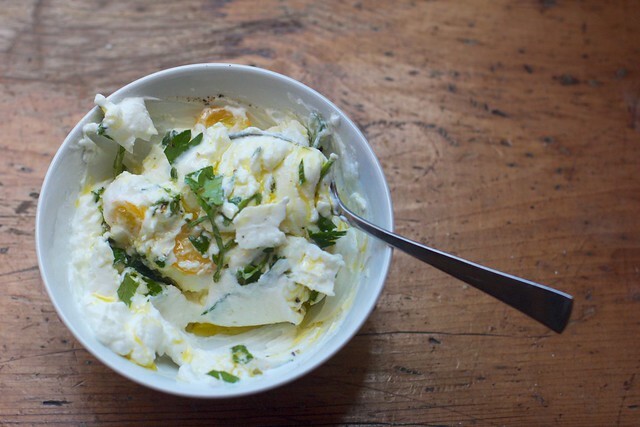 The original recipe calls for a dollop of crème fraîche, which we happened to have on hand (homemade, in fact, by Eric! ), but greek yogurt would work equally well. So with this spring weather we’ve been enjoying lately, I am more and more excited about summer fun. I recently picked up a new sleeping bag for summer camping adventures. We’ve been borrowing Eric’s brother’s bag for a while now, so it was time to finally invest in our own. It is the coolest sleeping bag I have ever seen, and I’m so, SO excited to use it. I’m really trying hard to not wish away these beautiful spring days until our first camping trip of the season. Preheat the oven to 275. 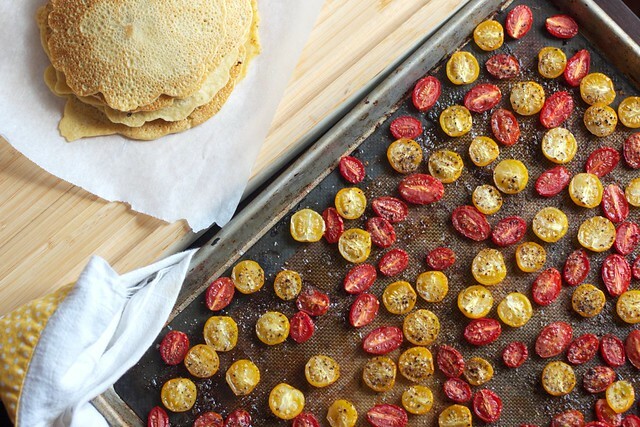 Arrange the cherry tomatoes skin side down on a baking sheet. Drizzle with olive oil and sprinkle salt and pepper over the top. Bake for 30 minutes. In a large pan, heat the olive oil over high heat and add the onions, za’atar, and salt and pepper. After a minute, turn the heat to medium and slowly cook the onions until lightly caramelized, around 20-30 minutes. In a mixing bowl, combine the chickpea flour, water, olive oil, salt, and pepper and whisk to combine. In a separate bowl, whisk the egg whites until they form soft peaks, then combine with pancake batter. Heat a pan over medium heat and oil generously – enough so the pancakes don’t stick. Pour a small amount of the batter in the pan to form 6-8″ cakes. When holes and bubbles start to form, about 2 minutes, flip the cake and cook for another minute more. Continue until all the batter is gone. 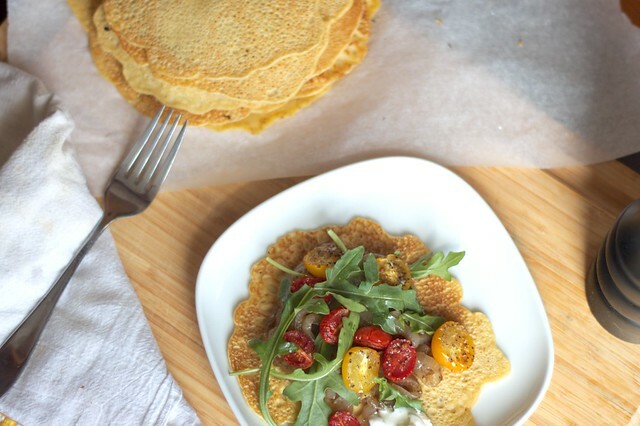 To serve, layer the onions and tomatoes on top of the chickpea pancake. 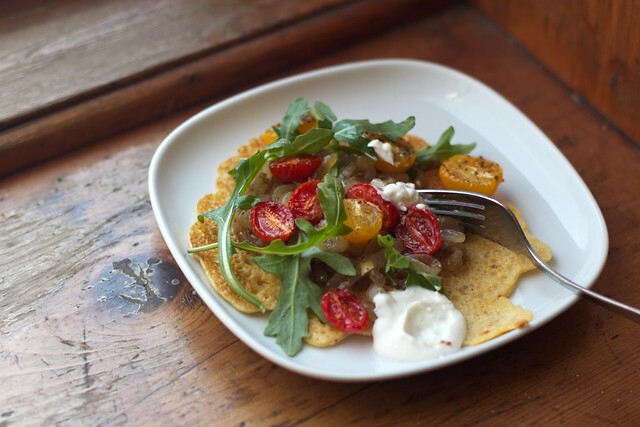 Top with arugula and crème fraîche as well as any other finishes you like – nuts, seeds, etc.